Stephen Palmer will be familiar to many Aural Innovations readers through his music projects Mooch and Blue Lily Commission. Also a science fiction author, Palmer has recently published his third and fourth novels Muezzinland and Flowercrash. His first two novels were Memory Seed (1996) and Glass (1997). Flowercrash takes place in Zaïdmouth, which represents Britain many years in the future after man's devastation of the environment has caused an Ice Age. Zaïdmouth is composed of five communities, or "urbs", which are connected by the artificial flower networks that create the virtual realities through which Zaïdmouth is run. Each of the urbs is governed by a shrine and it's clerics. The Shrine of Our Sister Crone, the Shrine of Root Sculpture, the Shrine of Flower Sculpture. My favorite was the urb of Blissis whose philosophy is one of hedonistic emotional existence with its Shrine of Complete Inebriation and Shrine of Delightful Erection, "where dubiously sticky rituals were enjoyed by men and women". You can't accuse Palmer of not injecting a little humor in an otherwise serious novel. The title Flowercrash refers to the impending crash of these flower networks, an event that "will result in the extinction of thousands of species, resulting in a monoculture", or the lose of diversity. Reading these descriptions brings to mind warnings of ozone depletion or some similar real world problem of environmental decay. But the "metaphors of knowledge" in the networks can be influenced, and how they are influenced will determine whether or not they ultimately survive. The prelude to the story introduces us to three cyborgs - Zoahnone, Shonsair and Baigurgone, who in the moments before the Ice Age make plans for how they will shape the post-Ice Age society. And what each of these cyborgs represents is the principle theme of the book. Zoahnone wants to create a utopia of the body. "If we fail, the flower networks will wither and humanity will be returned to a culture of computation and naked intellect". Shonsair and Baigurgone, on the other hand, "espoused a domineering, intellectual viewpoint". The main characters of the story, who embody this theme of emotions and pleasures of the body versus pure intellect, are Manserphine and Nuïy. Manserphine is the interpreter, a senior cleric, in the Shrine of Our Sister Crone. She is related to mermaids, descended from her great-grandmother. She suffers from severe insomnia, but has the dream skill that makes her a pivotal figure to influence the networks. Early in the story we discover that Manserphine got wrapped up in a bit of what seems like a cross between treason and industrial espionage, and as punishment she is banished from the Shrine for one season. She stays at the Determinate Inn, run by the mysterious Vishilkair and Kirifaïfra, also central characters in the story. As a senior cleric in the shrine, Manserphine has taken a vow of celibacy, a vow that she soon questions and then forsakes as her relationship with Kirifaïfra develops into a deeply physical and partially romantic one. Nuïy is a young man who hates women (the un-men) and detests any physical contact with anyone whatsoever. He is nearly immune to sensations of cold or pain. Nuïy's uncanny memory allows him to have identified and memorized all 3,656 of the drum rhythms which allow the clerics of the Shrine of the Green Man to control the flow of data in the flower networks. Along with his precision playing, this makes him of great value because no one has previously had the intensity of concentration to play with the perfect precision required to influence networks. But Nuïy's memory is only for facts, for what he can tangibly grasp, rather than being able to use imagination or reasoning. Through drumming patterns Nuïy is able to alter the networks. And it's hard not to imagine him recording an album, reading about how he puts on his headphones to begin the day's drumming, and the attention to timing intervals required for the injection of databases. As a humanist and atheist and feminist and eco-ist (that's a lot of ists...) I'm keen to help overthrow dismal patriarchal society and support alternative humane society. Divorcing intellect from body is one of the classic methods used by men to perpetrate all sorts of inhumanities, e.g., ruling elites, exploitation, anti-women, racism etc. As a hippy type who loves anything alternative, and is keen on cultural diversity, the theme of "enjoy your self" versus "do what you're told" is a pretty powerful one for me. Nuïy came about because of some reading I did about autism. There was a particular book about autistic-savants that inspired me. Nuïy is a kind of autistic-savant, though not as extreme as would be described in, say, a medical case of autism. I loved that extreme idea of him hating to be touched physically: a great analogy for his isolation from real human beings. I don't like much male culture. Competitive sport - not for me. Violence, war - do me a favour, boys, and grow up! Hierarchies? No thanks. Having a lot of the main characters as women allows me to explore human beings more, or so it seems to me. Exploring why a typical man is like he is doesn't interest me much. 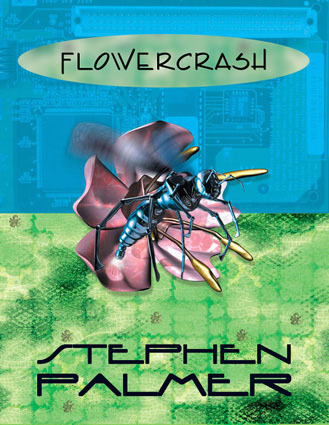 An element that makes Flowercrash such an enjoyable read is the imagery Palmer conjures up. For example, insects and pollinating bees seemingly going about their business in the gardens but actually involved in data transfer and network manipulation is surreal and would make for a stunning film if made by a Tim Burton or someone like that with the imagination and budget to bring these ideas and descriptions to the screen. The convoluted terms and imagery of conventional flowers and related species and network functions, and the interactions among them all, stretch the imagination, though the physical joining of humans (mind or mind and body) with computer networks is something that many writers have explored. At the most basic level the internet has certainly joined us together on a global basis in an unprecedented way. Even though we are physically sitting in front of our computers... it could be argued that this is only the beginning. Ultimately we discover that Nuïy and Manserphine are both agents of change in the garden networks. But in the struggle between these forces... who will win? Palmer is less than sanguine about the fate of the real earth's environment. So what will be the consequences of the Flowercrash of the novel? Destruction or a new beginning? I would urge science fiction fans to read the novel and find out. It's an exciting and thought provoking story that is well worth seeking out. For more information about Stephen Palmer's books and music, you can visit his web site at: http://www.geocities.com/dekray. Flowercrash is published by Wildside Press. You can visit their web site at: http://www.wildsidepress.com.